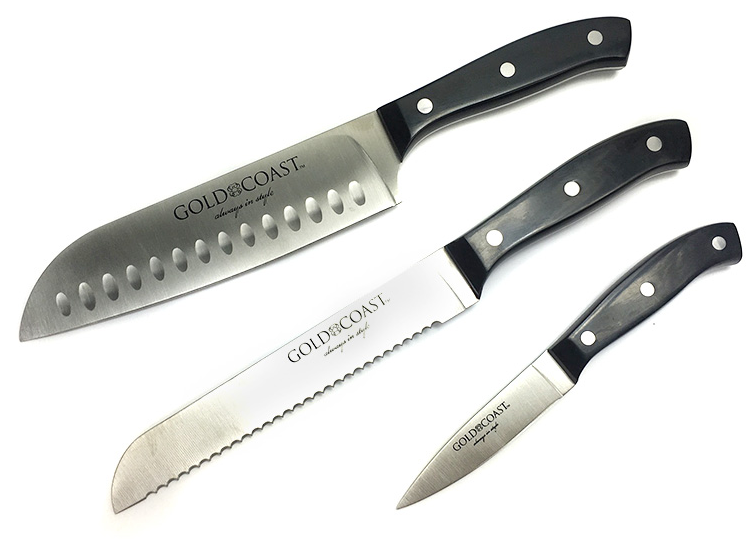 Gold Coast 3 Piece Professional Knife Set Only $8.49! Down From Up To $34.00! Ships FREE! You are here: Home / Great Deals / Gold Coast 3 Piece Professional Knife Set Only $8.49! Down From Up To $34.00! Ships FREE! 13 Deals has this Gold Coast 3 Piece Professional Knife Set on sale for $8.49 (Reg. $34.00) + FREE shipping! These 3 knives will have you covered with most any meal prep situation! They have a full tang design for strength and long term service and the contoured grip will give you confidence when slicing and dicing. Includes a 7.12″ Blade Santoku knife, a 3.75″ Blade Paring knife and a 7″ Blade Bread knife.